To download the full 2016 Annual Dairy Statistics & Trends Report, you can click here! 2016 was another down year financially for the dairy industry. The “All-Milk” price fell to $16.34/cwt., the lowest since 2009. Milk marketed during 2016 totaled 211.5 billion pounds which was up 1.9%; however, cash receipts stood at $34.6 billion, which was down 3.3% compared to 2015 and 30% compared to the record year of 2014. Lower feed costs again helped to offset part of the revenue loss. Milk per cow was up 378 pounds to a record high of 22,774 pounds. The average number of milk cows for the year was 9.33 million which represents a gain of 0.2%. The number of licensed dairies fell by 1,725 from last year’s revised number to 41,809. The first quarter of 2017 has seen an increase of 57,000 cows and a 1.0% gain in milk production compared to the first quarter of 2016. After showing strength in the later part of 2016 milk prices have moved down during the first four months of 2017. Domestic use was strong on a milk-fat basis in 2016, growing to 208.4 billion pounds, up 5.9 billion pounds from 2015 but stocks have still grown slightly. The dollar value of exports dropped from $7.2 billion in 2014 and $5.4 billion in 2015 to $4.8 billion in 2016. Sales to nine of our top 10 export markets declined as world prices were below U.S. prices. Sales have rebounded during the first quarter of 2017. U.S. dairy exports were up 14 % by volume and 17 % by value compared with a year ago—the best Q1 result since 2014, according to USDA’s Foreign Agricultural Service. 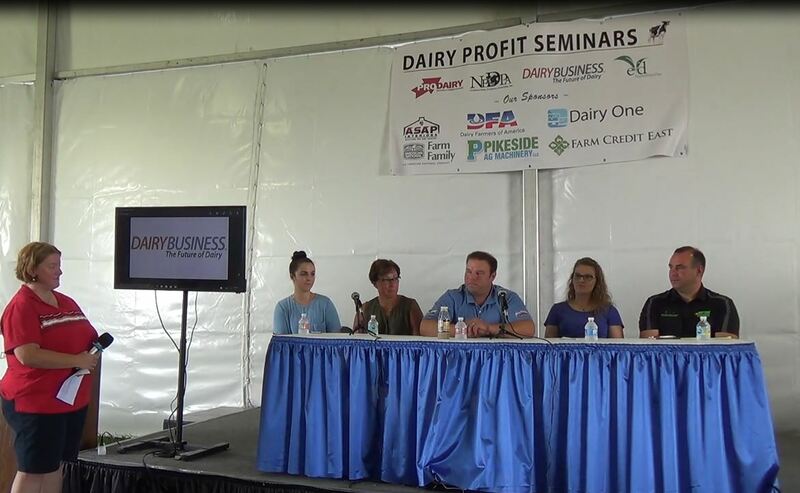 The 2014 Farm Bill included the dairy Margin Protection Program (MPP) as the new “safety net” for producers. A large majority of producers have enrolled for at least the base level of protection, but only 2,861 selected coverage for $6.50 or higher. Only those selecting the higher levels of coverage received payments on 2016. 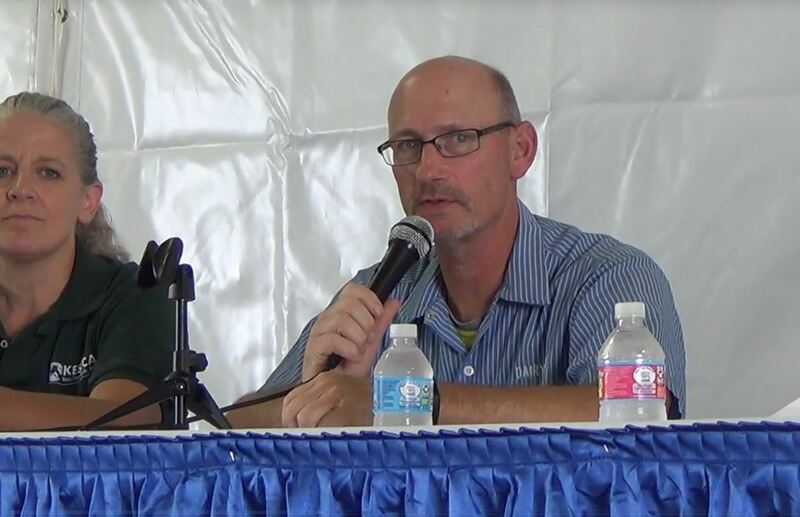 Adjustments or alternatives are certain to be major topics of discussion for the 2018 farm bill. U.S. 2016 milk production totaled 212.4 billion pounds, an increase of 1.8% over 2015. The 2016 total is a record high and an increase of 14.4% since 2007. Milk production has exceeded year earlier totals during 18 of the last 20 years, with the exceptions occurring during 2001 and 2009. In 2016 the Top 10 states for total milk production remained the same as in 2015, but there were some interesting changes. California retains a substantial lead in total milk production; however, they again had the largest decrease in total milk for the year, dropping 993 million pounds, while Wisconsin had the largest increase in production, gaining 1,093 million pounds. New York showed the second largest gain at 671 million pounds moving ahead of Idaho into third place on total milk. 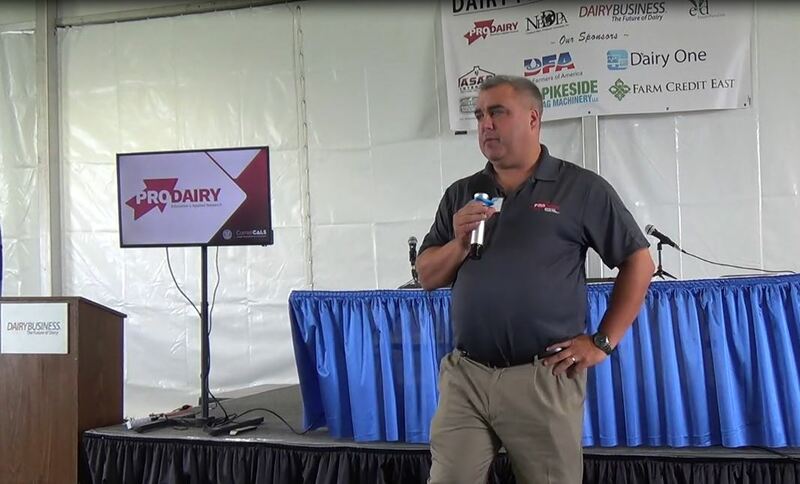 The U.S. dairy industry continued to be a significant factor in international markets. A total of 3.8 billion pounds of milk solids were exported in 2016. This represents 14.2% of U.S. production. It had a value of $4.8 billion. This is up slightly in volume from the 3.65 billion pounds of solids exported in 2014, but down in value from the 2015 total of $4.5 billion. 2017 Forecast: As of April 2017, USDA forecasts 2017 milk production to increase to 217.3 billion lbs., up 4.9 billion lbs. from 2016. Total marketings are forecast at 216.3 billion lbs., up 4.8 billion lbs. from 2016. The increase is based on steady gains in production per cow and cow numbers. For the first quarter, production is up 53.5 billion pounds or 1.0%. Among the states California is down 2.9% while Texas is up 16.0% and New Mexico is up 10.6%. Exports have increased 17% in value and 14% in volume for the first quarter of 2017; however, increasing world production, flat demand, uncertainty over trade policy and the strong U.S. dollar will put pressure on exports for the remainder of the year. Production per cow in the U.S. averaged 22,774 lbs. in 2016, up 378 lbs. from 2015 and 1,438 lbs. more than 2011. There were some changes in states included in the top 10 states as New York, Wisconsin and Nebraska moved in, while Utah, Nevada and California fell out. 2017 Forecast: USDA forecasts annual production per cow at 23,150 lbs. in 2017, an increase of 376 lbs., or 1.6%. For the first quarter production is running behind the forecast with an increase of only 24 pounds per cow compared to the first quarter of 2016. USDA released its semi-annual Cattle report on Jan. 31, 2017 including Jan. 1 estimates of U.S. dairy cows, replacement heifers and heifers expected to calve within the next year. At that time milk cows were estimated at 9.349 million head. This is up 38,600 head, from Jan. 1, 2016. Dairy replacement heifers (>500 lbs. ), at 4.754 million head, were down 60,000 head from a year ago. Based on those estimates, there were 50.9 heifers >500 lbs. per 100 cows, down about 0.8 heifer/100 cows from 2016’s revised estimate. Of the total dairy replacement heifers, 3,071.6 million head are expected to calve in 2017, down 40,000 from 2016. As of Jan. 1, 2017, there were 32.9 replacements expected to calve in 2017 for every 100 cows currently in the U.S. herd. This is down 1.6 from 2016. 2017 Forecast: As of April, USDA estimated the U.S. Dairy population will average 9.385 million head in 2017, up 57,000 from 2016. For the first quarter of 2017 cow numbers stood at 9.37 million head, up 57.000 from the first quarter of 2016, so on track with the estimates. USDA no longer reports data by herd size, so we cannot measure impacts as we did in the past. A few notes indicate the impact of herd size. Ten of the top 13 counties for milk production are in California, New Mexico and Arizona, all states with large herds. The average herd size in the US continued to grow in all regions and stood at 223 cows, up 9 cows per herd from 2015. Nine states average over 1,000 cows per herd, with New Mexico the largest at 2,100 cows per herd. The 2014 Farm Bill brought a new tool intended to limit risk for producers, the Margin Protection Program. The MPP, which runs until December 31, 2018, functions much as an insurance program. It is designed to protect producer income when the difference between milk price and feed cost drops to a level that producers decide is unacceptable. Producers select the margin (between $4 and $8/cwt) where they want coverage to begin and pay the premium established for that level of protection. Participation has grown slightly each year. Overall 62% of the dairies and 85% of the production was signed up for at least the base level of protection for 2017. Signups were highest in the West (81% of the operations and 93% of the milk covered) and lowest in the Northeast (46% of operations and 64% of the milk covered). Margins were low enough to generate payments for producers selecting high levels of coverage early in the year; however only 2.861 producers selected coverage for $6.50 or higher for the year. Only those selecting the higher levels of coverage received payments on 2016. A total of 4,852 producers did receive payments totaling $11,169,506 for the May/June period when the Margin dipped to $5.76/cwt. Wisconsin and Minnesota had the most producers receiving payments. Adjustments or alternatives to the MPP are certain to be a major topic of discussion for the 2018 farm bill. It took just 60 U.S. counties to market 50% of the total milk marketed through California and federal orders in May 2016, according to a summary from the Central federal milk marketing order’s administrator. That’s up from 58 counties in May 2015. The 13 largest dairy counties marketed 25% of all milk through federal and California orders in May 2016. Those counties (based on federal and California order marketing statistics) were: 1) Tulare, Calif.; 2) Merced, Calif.; 3) Kings, Calif.; 4) Kern, Calif.; 5) Stanislaus, Calif.; 6) Fresno, Calif.; 7) Maricopa, Ariz.; 8) Yakima, Wash.; 9) San Joaquin, Calif.; 10) Lancaster, Pa.; 11) Weld. Colo., 12) Pinal, Ariz. and 13) Chaves, N.M. 185 counties accounted for 75% of the milk marketed during May 2015 in the California and federal orders. 1,003 counties decreased order marketings. The continued decline in milk price contributed to a larger than normal reduction in the number of U.S. licensed dairy operations during 2016 with a drop of 1,725 (4.0%) compared to 2015, according to USDA. The total number of operations averaged 41,809 during 2016, down from a revised 2016 total of 43,534. The numbers and %ages are both up from 2015. U.S. commercial dairies are down 9,482 from 2011, a 16.5% decline. The data does not determine whether the decline is due to a dairy going out of business or merging with another dairy. USDA compiles the information from state and other regulatory agencies in charge of licensing dairy operations. The information is released in USDA’s February monthly milk production report and represents the “average” number of licensed operations during the past year. “DairyBusiness” calculations for average cows per herd and average milk per herd are based on USDA’s estimates for total cows and milk production in a state, divided by the number of commercially licensed dairies. Low milk prices appear to have impacted, U.S. replacement dairy cow prices as they dropped in 2016. The 2016 average of $1,760 is $230 lower than 2015, but still $340 higher than 2011 according to the USDA National Ag Statistics Service (NASS). Higher production and lagging exports resulted in lower receipts for producers in 2016. The first quarter of 2017 is mixed as both production and exports are up, but prices are moving down. After reaching a record level in 2014, USDA NASS’s annual “Milk Production, Disposition and Income” summary showed that U.S. dairy cash receipts from marketings of milk during 2016 dropped again to $34.6 billion. This is 30 % lower than 2014. Producer returns averaged $16.34 per hundredweight, 31.8 % lower than 2014. Marketings totaled 211.5 billion pounds, 1.9 % above 2015. Marketings include whole milk sold to plants and dealers and milk sold directly to consumers. Receipts represent gross income, not net income. Based on previous preliminary USDA Economic Research Service milk cost of production estimates, 2016 total dairy farm production costs averaged $26.31/cwt. The annual average number of milk cows on farms in 2016 was 9.328 million head, up 14,000 from 2014. Milk production per cow, at 22,774 lbs., was 378 lbs. more than 2015. Based on the 2016 average production and return per hundredweight, the “average” U.S. cow generated $3,721 in income. This is a drop of $113 from 2015 and $1,614 compared to 2014, a drop of 30.2%, reflecting the financial stress faced by producers over that past two years. The picture for cash receipts for producers looks to improve in 2017. As of April 2017, USDA projected an all-milk price in the range of $17.40-$17.90/cwt. (mid-range of $17.65/ cwt.) which would be up over $1/cwt from 2016. With milk marketings expected to reach 216.3 billion lbs., that would yield 2016 gross receipts from milk sales of about $38.18 billion, up about $3.6 billion from last year. The U.S. had 10 states topping $1 billion in annual cash receipts from milk marketings in 2016. This is the same number and states as 2015. The states are: California, Idaho, Michigan, Minnesota, New Mexico, New York, Pennsylvania, Texas, Washington and Wisconsin. California and Wisconsin accounted for about $11.1 billion or about 32% of total U.S. cash receipts from milk marketings in 2016. Find the full report at http://usda.mannlib.cornell.edu/usda/current/MilkProdDi/MilkProdDi-04-27-2017.pdf.